But I never learned to make a few American classics. I have no clue how to make a grilled cheese sandwich. I was well into my 20’s when I made my first batch of chili, and I had never roasted a chicken. 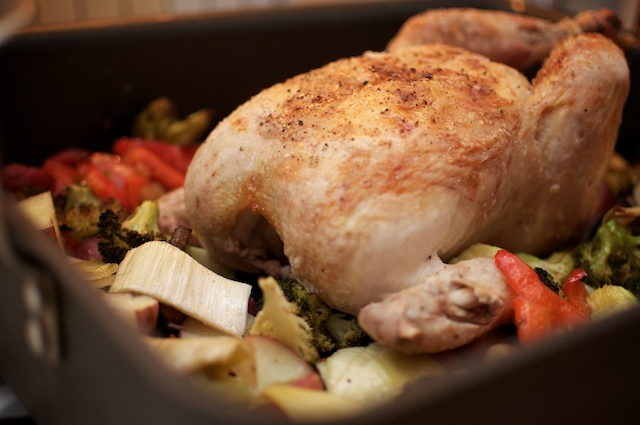 Recently my friend Shelly sat me down over brunch and explained the simple beauty of roasting a chicken for dinner. 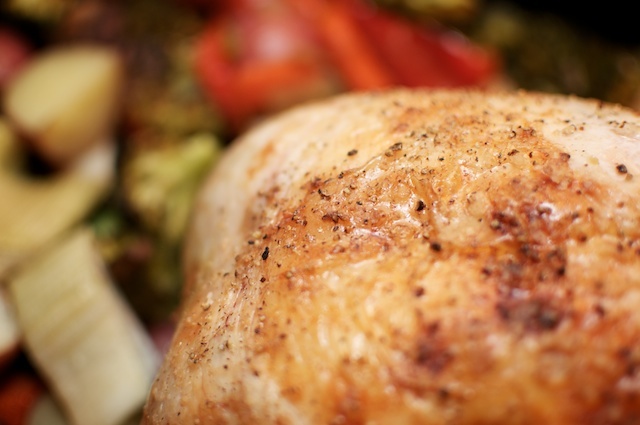 The whole bird gets slathered in salt and butter and cooks over a bed of veggies. Dinner is DONE in one big pan. I like it. Here’s a pro-tip: A 4-ish lb. chicken will take about 1 hour to roast. The veggies take about 30 minutes. 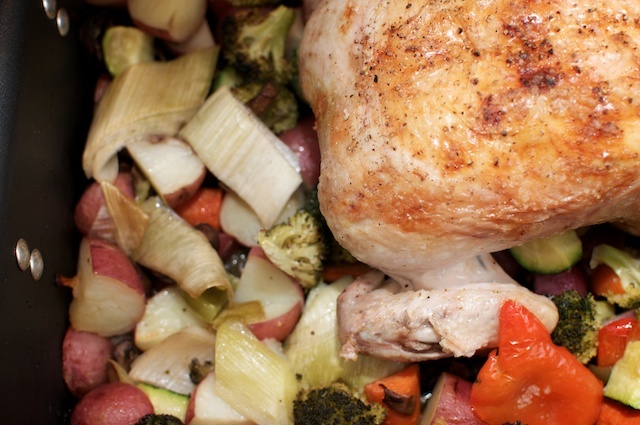 So roast the chicken for 30 minutes, before flipping it over and adding your veggies. I did not do this. I roasted all the veggies for an entire hour. I had VERY mushy vegetables, which the man enthusiastically ate. He is nice to me. Veggies sliced into 1 inch pieces: potatoes, broccoli, red bell peppers, leeks, mushrooms etc. Rinse the entire bird, inside and out, under cold water. Pat dry with paper towels. Make sure you have a VERY dry bird, inside and out, or else the chicken will steam, instead of getting nice and crispy on the outside. Place chicken on it’s back in a large roasting pan. The breast bone should be pointed up. Brush half the melted butter on the chicken and generously salt. Then shake on some pepper. Here is the optional part: You can stuff the chicken’s cavity with garlic, lemon and herbs. I didn’t and it was delicious, but I’m sure it would only improve the flavor. Roast the chicken on it’s back for 30 minutes. Remove the pan from the oven and flip the chicken over. Brush remaining butter on top of chicken and generously salt and pepper. Surround chicken with the veggies of your choice. Potatoes are essential, but you can fill in the blanks after that. Drizzle vegetables with olive oil and salt, and return to the oven for 30 minutes. Remove the chicken from the oven, and you should have a golden, crispy skin. Let it rest for about 10 minutes to let all the juices settle back into it. Then slice into a bit to ensure it’s cooked through. Serve and enjoy!